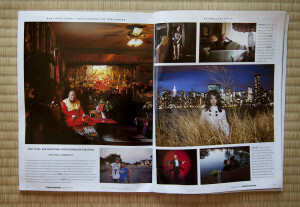 Green Card Stories and Ariana Lindquist were featured in the National Press Photographers Association Best of Photojournalism magazine for 2012. Michigan’s Governor Snyder delivered a statement promoting immigration and Green Card Stories at the Global Detroit event on October 18, 2012. Laura Danielson and Stephen Yale-Loehr were interviewed on Detroit’s NPR local radio station WDET on October 18, 2012. Global Detroit featured Green Card Stories in its publication Model D on October 16, 2012. 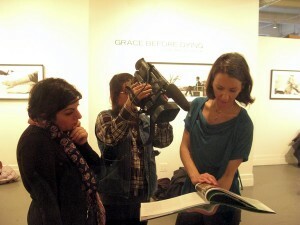 National Public Radio featured Green Card Stories on its photo blog on July 10, 2012. The Minneapolis Star Tribune covered Green Card Stories and Laura Danielson’s involvement in an article on July 10, 2012. Ariana Lindquist was interviewed by The Bemidji Pioneer on July 8, 2012 for her work on Green Card Stories. Stephen Yale-Loehr and Alessio Balada, an individual included in Green Card Stories, will speak about the book on the Out of Bounds Radio Show hosted by Tish Pearlman on July 5, 2012 on WEOS-FM and on July 8, 2012 on WSKG-FM. The New Yorker featured Green Card Stories on its Book News website on June 8, 2012. Mary Apick was interviewed in a full article in the May/June 2012 issue of Zan Magazine, a publication dedicated to modern Iranian American women. Mary spoke of her experience of being included in the book and what it’s meant to be an immigrant in the United States. Stephen Yale-Loehr was on interviewed a panel on WSKG’s Off the Page on May 4, 2012. The panel covered the immigrant experience and the influence it continues to have on individuals, on American society and life in the Finger Lakes region. Mr. Yale-Loehr addressed current immigration topics while highlighting some of the stories from Green Card Stories. The panel also included Gail Holst-Warhaft, Poet Laureate of Tompkins County and Editor of Far From Home and Jay Leeming, Editor of the Poetry Magazine Rowboat. The Huffington Post featured an article and slideshow of Green Card Stories on March, 1, 2012. U-T San Diego featured local athlete, Kate Major, in their article on Green Card Stories on February 28, 2012. CENTRO Tampa featured an article in Spanish on Saundra Amrhein and Green Card Stories on February 23, 2012. Univision ran two segments on Green Card Stories in Spanish. The first segment aired on February 22, 2012 and highlighted Cleto Chazares, a former Mexican migrant worker and now high school principal and individual featured in Green Card Stories. He was recently honored with the Hillsborough Counselor Association High School Principal of the Year. The second segment aired on February 23, 2012 and included an interview with Saundra Amrhein and more details about the book and the immigration situation in the United States. Frank Silva interviewed Saundra Amrhein on February 22, 2012 during his music program Latino54 on WMNF 88.5. Author Saundra Amrhein spoke on two programs in Florida. She was joined by Cleto Chazares, a former Mexican migrant worker and now high school principal and individual featured in Green Card Stories. On February 15, 2012, they were interviewed on Daytime TV based in Tampa and broadcast around the Southeast of the U.S. The following day, South Florida’s NPR station, WLRN 91.3 included them on their program Under the Sun. Saundra discussed the book and its role in the current immigration debate. Cleto, who was recently honored with the Hillsborough Counselor Association High School Principal of the Year, spoke about his experience as an undocumented immigrant in the United States. On the In America blog, author Saundra Amrhein discussed the process of selecting the individuals to include in the book and their reactions when being interviewed and photographed. When asked what it means for so many people to make the sacrifices that they do to immigrate to a new country, Saundra responded, “[I]t requires a phenomenal amount of resilience to come here and go through what they go through…. They have such a tenacity and strength, you find that not only has that strength enabled them to become really productive people, but that has also led them to pursue what they love in life.” Saundra also explained that one thing she hopes people learn from Green Card Stories is that it helps shed some of the stereotypes and make the readers more empathetic toward immigrants and their contribution to the United States. Saundra Amrhein was interviewed on NY1’s Spanish television channel on Wednesday, February 1. 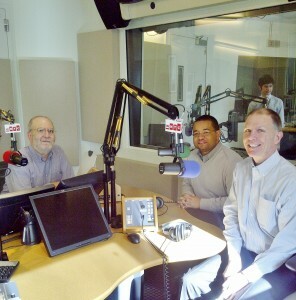 Two individuals featured in the book, Angela Andrade and Randolph Sealey, were interviewed with collaborator Stephen Yale-Loehr on WNYC’s Leonard Lopate show on Monday, January 30, 2012. Stephen explained the current immigration debate and intricacies of immigration law. Angela and Randolph’s stories were woven into the discussion as examples of how they were able to obtain their green cards through legislation that no longer exists. In the BNA Daily Report article, “Panelists See Small Government Steps to Ease Long Pattern of Visa Restrictions” published on December 2, 2011, Stephen Yale-Loehr described Green Card Stories as a way “to put a human face on immigration.